If you have guests that have travelled from overseas or interstate, it would be a shame not to provide them with some of the fine food and wine that South Australia has to offer. Only a short drive from Adelaide, is some of Australia’s finest and most picturesque wine country. Your guests would love Grant’s wine tours through some of the world’s most beautiful wine areas. When you are planning on showing your family around on holiday, or perhaps business associates over for a conference, Grant’s Coach hire will be able to help make the Food and Wine tours of Adelaide impressive to say the least. To make sure that you have a memorable and relaxing day, we will work with you to provide an itinerary that will suit your needs. If however you know where you want to visit on your winery tour, we can organise a timetable of your destinations with you without a problem at all. 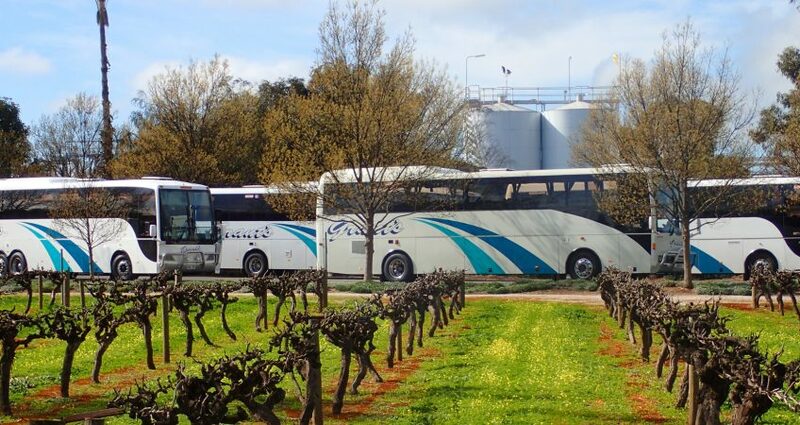 Grant’s Coach Lines Mini buses have wine tours of the Barossa, where you can sample some of the world-renowned wines in comfort and style. Alternatively, you can go down to where the vineyards meet the sea for wine tours throughout the McLaren Vale region, and not to mention we also provide tours through the Adelaide Hills wineries or breweries. When we had family coming from overseas for a wedding, we wanted to make sure that they got a chance to enjoy some of the amazing wines that the Barossa produces. To make sure that we all had a chance to enjoy it ,we arranged for one of Grant’s coach line’s mini buses to pick us up. One of the great benefits of organising a wine tour through Grants Coachlines is that everyone will be together. By travelling in a mini-bus or coach, the fun and laughs don’t have to stop when you are travelling to your next cellar door. By organising a Mini bus with a driver, you are ensuring that no one will have to miss out on any of the tastings that are on offer! Grant's Coachlines is one of Adelaide's premier transport providers. Our services include coach charters, school bus charters, airport and general transfers and winery tours. 24 Audley Street, Woodville North, SA 5012. Copyright 2017 Grant's Coach Lines. All right reserved.